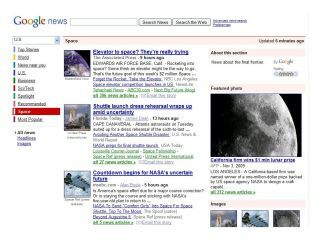 Google News - APpy again? Associated Press stories have returned to Google, with discussions between the media agency and the search giant continuing. News giant AP's stories have been missing from Google News of late, with the two believed to have been butting heads over the propagation of content. The ever-controversial News service from Google is at the centre of the debate over paid versus free content, with some news providers accusing the search giant of profiting from their work. AP's feeds, however, are back on Google News with Google telling the Wall Street Journal's Digits blog that discussions were ongoing. "We have a licensing agreement with the Associated Press that permits us to host its content on Google properties such as Google News," said the statement. "The licensing agreement is the subject of ongoing discussion so we won't be commenting further at this time." It's certain that this will not be the end of the debate, with the question of news aggregation on the internet likely to be an increasingly pressing issue through 2010.